At Convince & Convert we’ve been doing a lot of content marketing strategy work for B2B companies lately, and while every client circumstance is different (which is what makes consulting an interesting endeavor), I’ve definitely found some common themes and typical areas for improvement. 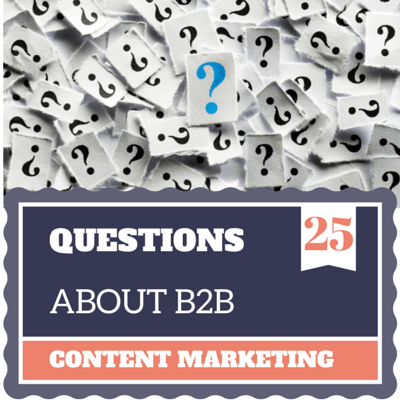 Here are 25 of the questions I’ve been asking to B2B companies about content marketing. Maybe some of these will make you think about your own content marketing program and opportunities to expand, enhance, and optimize it. I sprinkled throughout some of the tools we often use and recommend. I’ll work on a full tools blog post for early next year. How do you get non-marketers involved? How do you unlock the knowledge of your subject matter experts? Do you routinely interview your customers? How are you decentralizing content so your "best stuff" isn't solely residing on your own URL? How are you atomizing your content and taking a big idea and making many smaller content executions from it? Do you capture and analyze queries that come in to your customer service team? Do you "market your marketing" and create promotional plans for major content initiatives? How can you get employees involved as social media advocates? What is your Slideshare strategy? Are you maximizing the creation of real-time content (including photos and short videos) at events you host or attend? How are you using marketing automation to communicate 1:1 with prospects? Do you determine whether or not content is "gated" with a form based on funnel stage, rather than content type? Do you use social log-in to maximize form completion rates? What metrics do you use to measure content effectiveness, beyond consumption? Do you use tools like Buzzsumo to investigate what content in your category is already successful? Have you considered creating a podcast to spotlight your best customers? Are you using retargeting ads to put your next piece of great content on the radar of previous visitors to your site? Are you using content hubs like Uberflip to build topical destinations containing content of multiple types and formats? When you create great content, do you promote it to employees (especially sales) first? How are you creating more video, and optimizing it to be found?